Beach Filter Products, Inc offers a full line of compressed air filters, hygroscopic reservoir/tank breather filters, and moisture control products. Beach developed and began producing Sta-Dri® clay desiccant humidity control pouches over 15 years ago for use in storage and shipping. Now, one of the largest producers of desiccant pouches for larger spaces, we sell into automotive, RV, marine, firearm storage, collectibles and a myriad of other unique applications. 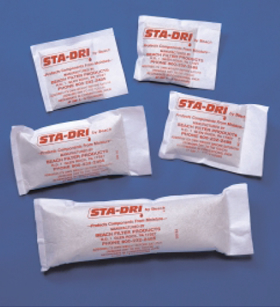 Our Sta-Dri® bags are made with a natural clay desiccant mined from the earth that contain no additives. We use polyester fabric to hold the clay desiccant which enables regeneration in a typical household oven. Beach is committed to environmentally friendly products, processes and operations. We Reduce, Recycle and Reuse throughout our plant. We are committed to providing the consumer with the best product options to keep their valuables dry and safe from the harmful effects of moisture. Founder Williard C. Beach, an inventor and creative problem solver, would have been proud of our moisture control product line. Thank you for considering Beach as your problem solver.